The 77 leather tool bag is designed to attach to the forks or handlebars of your motorcycle. It attaches using the supplied leather straps. 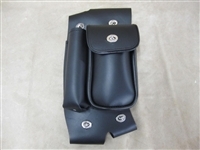 It has quick release buckles for easy access while riding. 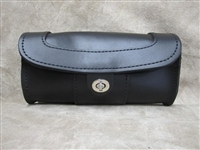 This small leather tool bag is perfect for carrying sunglasses, cell phone, keys, and other items that the driver wants to have easily accessible. 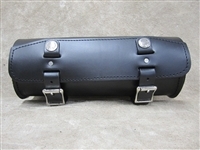 It is customizable to match your leather saddlebags, sissy bar bags and windshield bags. 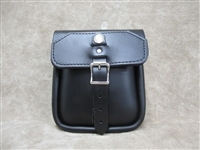 4" x 9"x 2.75"
The 99 is a leather sissy bar bag designed to attach to the sissy bar on the rear of the motorcycle. The bag opens with a quick release buckle. All straps are supplied with the bag. 9"H x 7 ½"L x 3"
The 90 leather tool bag attaches to the saddlebag guards on most Harley Touring Bikes 1994 to present, which includes Road King, Road Glide, Street Glide, Electra Glide, Ultra Classic and FLH. They come as left or right side, giving you the options of one or both sides. For the driver the left side is more popular, if you carry a passenger you will want both the left and right side. This leather tool bag is great for holding the small things that are should be easily accessible, such as a cell phone, camera, keys, garage door opener and registration. Can also be ordered with the bottle holder item number 90W. 15 ½" H x 7" L x 2 ½”"
The 102 leather tool bag is a large rectangular bag. It fastens with roller bar buckles and it does not have quick release buckles. It is made out of our 10 oz leather so it is sturdy and will not break or fall off the bike causing other riders to have to dodge your tools. It is designed for motorcycles with wide front ends and can be attached to the forks either above or below the head light, handle bars or down by the motor mounts. All straps required to attach the bag are supplied with the bag. 6"H x 12"L x 3"
The 295 leather tool bag is a long deluxe bag. The bag opens with a turn fastener. 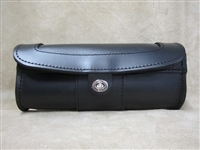 It is made out of our 10 oz leather so it is sturdy and will last for years and keep all of your valuables safe. This leather tool bag is designed for motorcycles with wide front ends and it attaches to the forks above or below the headlight, handle bars or down by the motor mounts. 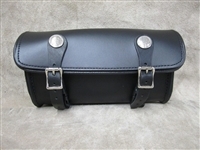 All straps required to attach the leather tool bag are supplied with the bag. 5"H x 12"L x 3 ½"
The 200 leather tool bag is a short deluxe bag. It closes with a turn fastener. It is made from our 10 oz leather and it will not come apart or fall of your motorcycle causing other riders to dodge your flying tools. This leather tool bag is designed for motorcycles with narrow front ends and it attaches to the forks either above or below the head light, handle bars or down by the motor mounts. 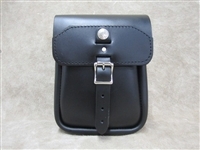 All straps required to attach the leather tool bag are supplied with the bag. 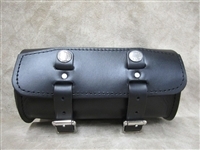 6"H x 10"L x 3"
The 95 leather tool bag is a round long bag. The bag opens and closes with quick release buckles, which are hidden under the straps. This leather tool bag is made from our 10 oz leather and won’t break or fall off your motorcycle forcing fellow riders to dodge the flying tools. It is designed for motorcycles with wide front ends and it can attach to the forks under the headlight, the handle bars or down by the motor mounts. All straps for attachment are supplied with this leather tool bag. 5"H x 12"L x 5"
The 100 leather tool bag is a short round bag. The bag opens and closes with quick release buckles. This leather tool bag is made from our 10 oz leather and won’t break or fall off your motorcycle forcing fellow riders to dodge the flying tools. The 100 leather tool bag is designed for motorcycles with narrow front ends and it attaches to the forks either above or below the headlight, handle bars or down by the motor mounts. All the straps required for attachment to the motorcycle are supplied with the bag. 5"H x 10"L x 5"
The 90W leather tool bag attaches to the saddlebag guards on most Harley Touring Bikes 1994 to present, which includes Road King, Road Glide, Street Glide, Electra Glide, Ultra Classic and FLH. They come as left or right side, giving you the options of one or both sides. For the driver the left side is more popular, if you carry a passenger you will want both the left and right side. This leather tool bag is great for holding the small things that are should be easily accessible, such as a cell phone, camera, keys, garage door opener and registration. A water bottle holder was added to the front. Can also be ordered without the bottle holder item number 90. 15" H x 7½" L x 2½"